After spending the last two years getting their BWTF water testing program up and running, the Virginia Beach Chapter decided to launch their Ocean Friendly Gardens Program with a garden project at Seatack Elementary School. The chapter formed an OFG committee, including two members of the executive committee and a chapter volunteer who is a horticulturist at the Norfolk Botanical Garden and was able to provided guidance on plant selection and garden design. The committee also found a local teacher who was willing to champion the installation of an OFG at Seatack Elementary School. The school site offered great visibility for the garden, plus it had serious existing drainage issues that needed correction. Construction of the garden took about five hours, with 35 kids and 20 adults participating, including students, parents, teachers and chapter volunteers. Signs were created and posted in the garden to educate the community, and a second rain barrel was installed and painted by fifth graders to illustrate how CPR can help protect the ocean. The new garden has become a central point for the school and has been integrated into the curriculum to educate students on watersheds, rain barrels, conservation, and the ocean. Fifth grader Anjel Calderon stepped up as a true leader of this school project. He worked in the garden during the summer, weekends, during special team projects and during the morning Garden Breakfast Club. This video helps tell the story of how working in the OFG gave Anjel the confidence to become a leader in his school. The Seatack Elementary School OFG also inspired the creation of an ocean-themed sculpture, Ocean Dance, by local artist Debra Chako. Funded by a sustainability grant, the artist incorporated local fish made by 5th graders into her design. A large assembly was held to dedicate the sculpture with the entire student body, teachers past and present, community leaders and members of the Virginia Beach Chapter and First Colonial High School Surfrider Club in attendance. The chapter was presented with a plaque honoring the partnership between Surfrider and the school. After the installation of this successful garden, OFG volunteer and horticulturist Alexandra Cantwell has continued to promote the principles of CPR through short talks at garden center expos and classes at Norfolk Botanical Garden, making the connections between how homeowners treat their yard and the health of the Chesapeake Bay. 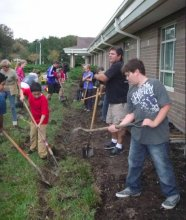 Ocean Friendly Gardens are also sprouting up at other local schools, with two additional gardens already installed and another one being planned for Fairfield Elementary School by a local student for his senior project.